Filling in the search form is your exclusive access to the cheapest car rental vehicles in Marseille! 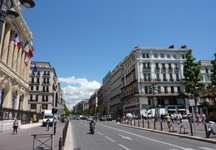 Explore the brightest city of France with car rental Marseille! Make your staying in Marseille relaxing, comfortable and pleasant – choose one of the stylish vehicles we offer in car rental Marseille! Our service compares car rental prices for you all over the world in 30,000 locations within a second! Complete the form and check how much you can save with car rental Marseille! Then choose the desirable Marseille car rental location, pay attention to Must Know and Places to Visit with car rental Marseille! The largest commercial port of France, a major industrial center of the country and the second most populous city in France – it is beautiful Marseille. Founded by the Phoenicians in 600 BC Marseille has a long history in which this port city with an interesting dynamic atmosphere had such cultural diversity. You can watch the auction in the Old Port, where the fishermen are trying to sell their catch, or drive your car rental vehicle on the roads along the waterfront overlooking the Calanques, breathtaking rocky sea bays. To rent a car in Marseille you must be over 20 years old and have a driver's license (EU or international driver's license) with experience more than one year. In France the movement is on the right. In the absence of specific signs, your driving speed should not exceed 50 km/h in town, 80 km/h on the countryside, 110 km/h on highways and high-speed of 130 km/h on motorways. Seat belts must be worn by all passengers. Yes, yes, the one Alexander Dumas wrote in his novel "The Count of Monte Cristo" about. 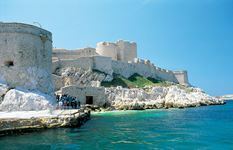 Chateau d'If is located on the tiny island. The most famous prisoner of the castle - Mirabeau, a hero of the French Revolution. The cells of the castle are always popular within the visitors, while from lookouts on the roof of the Chateau d'If you can see a beautiful view of Marseille. The island is accessible with a boat. Drive your car rental vehicle to the Belges port first. The boat departs from its dock (regularly from 09:00 to 17:00, the last return at 18:30, about 15-20 minutes on the road, the cost of a walk is about 10 euros). Entry to the castle will cost you about 5 euros. 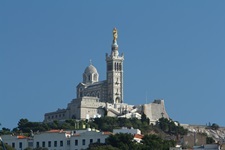 The most notable of Marseille attractions is the Roman-Byzantine cathedral of Notre-Dame de la Garde. This imposing building of the XIX century is at the highest point of Marseille, just south of the old port. Tourists are staggering 9-meter-high bell tower. Bell measuring 2.5 meters in height and weighing in at just 8324 kg leaves no one indifferent. Basilica is open to visitors. There are several viewing platforms from which all Marseille is visible at a glance. 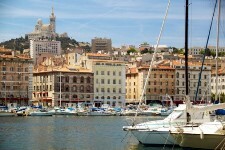 Get in your car rental vehicle and hurry up to see Marseille in full view from the height of the Basilica! Using a car rental vehicle you’ll easily find Borelli Park - it stretches in an area of ​​17 hectares in the southern part of the city and is the largest urban park in Marseille. 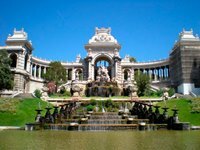 The park consists of two parts - a regular French park and English-style landscape park. In addition, Borelli botanical garden is adjacent to the park. In the park there is the palace of Borelli (18th century), beautiful fountains, and a smaller version of the Basilica of Our Lady. 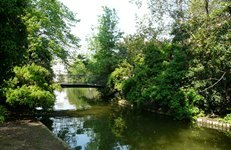 The park was established in the 18th century by the industrialist Louis-Joseph Borelli. Longchamp Palace complex consists of three parts: in the center there is a magnificent fountain, real water castle, from it to the north and south there is semi-circular colonnade. On the north side is the Museum of Fine Arts, and to the south - the Natural History Museum. Behind the palace there is Zoological Garden, it has retained its name despite the fact that the animals are no longer there. Jump into your car rental vehicle and drive to the Palace – there you’ll see lots of interesting things! RentalCars24h.com offers you reliable car rental Marseille services that will help you to feel free and independent when moving around the town. Providing best online prices for car hire Marseille services, RentalCars24h.com allows you to save money each time when you rent a car in Marseille.